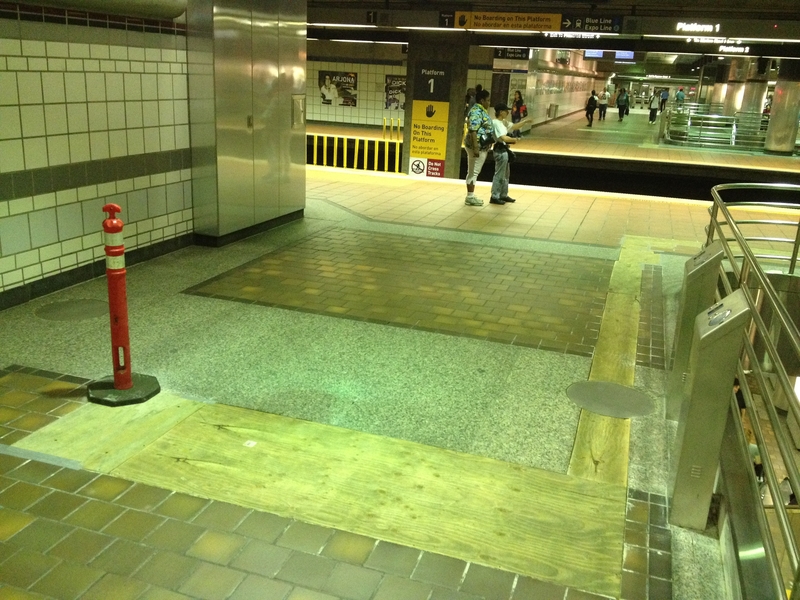 Early construction work involved removing a section of floor to accommodate the validators and their electronics. The photo shows the current location of the validators; the new ones will be in a line across the floor. Photo: Metro. This is something that has been discussed before on this blog and the comments board and now the work is underway: Metro is relocating stand-alone validators at 7th/Metro Station in order to make it easier for customers to TAP when transferring between the Red/Purple Line subway and the Blue Line and Expo Line. Work began earlier this week; the idea is to move the existing validators and add some news ones to form an array of validators that will serve a lot of customers at once. Customers will be able to walk by the validators and tap without having to go out of their way and queue up at inconveniently placed equipment. Metro tested the validator placements in a variety of arrays and found that this particular array encouraged the best crowd flow and most frequent tapping by customers. The arrays were vetted by Fire-Live-Safety personnel as well as ADA staff. Metro asks that everyone be courteous and careful while the work takes place. We have to TAP again when transferring from the red/purple to the blue/expo? This doesn’t make sense to me because there are no vending machines inside the secured “locked” gate area. This should be a free transfer. Well, everyone must taps everything BEFORE he or she boards a Metro vehicle. Maybe the vending machines should have a trip planner so that a ticket purchaser will know exactly how many vehicle he or she will be boarding so that the machines can calculate a person’s TRUE fare within the day. This calculate could encourage the ticket purchaser to buy a day pass. If someone ignores the vending machines’ calculation and purchase a one-trip ticket. The new validators should have latched gates. The new validators should also force the passengers to load additional money to the TAP cards on the spot. Now can metro add more benches or places to sit on platform 2? I think Metro really needs to rethink their fare policies. There should be no need to TAP in again when they transfer to another line once they are inside the system. I can’t think of any other transit system that does this. Does this mean I need to tap my tap card again after I tap my tap card to enter the fare gate from the figueroa entrance if I want to ride the Blue Line or the Expo Line? You only have to tap once before boarding any train. Metro wouldn’t need these additional validators at transfer points if they just change to a different fare system. Contactless cards allow things like pay-by-the distance plan to be implemented with a simple tap-in and tap-out policy. By doing that, extra money wouldn’t have to be spent in installing TAP validators at transfer points like these. Once you TAP in to the system, you’re good until you TAP out when you get to your destination. The system will automatically calculate how much to deduct based on how many stations you travelled regardless of where you made the transfer. So if you TAP in at Grand, transfer to the Red Line and get off at Civic Center, you TAP off at Civic Center and the system will automatically deduct the fare for four stations worth of travel. It doesn’t matter if you made a transfer or not, it’ll be the number of stations you traveled through that matters. That way, going from Grand to Vernon on the Blue Line will be charged the same amount of four station trip as going from Grand to Civic Center on the Blue and Red/Purple Lines. With the emerging payment systems like NFC enabled smartphones and contactless credit and debit cards, Metro needs to look at how best to adopt a better fare system based on what technologies can do. I see these machines all the time but I must confess I have no idea what they’re for. Are there going to be signs to indicate what they do and who should use them? If a one-way Metro ticket from Culver City to Hollywood or Union Station costs $1.50 one-way fare and it takes me a transfer at the 7th St Station in downtown from the new Metro Expo Culver City Line to the Red Line subway to Hollywood then why should I have to TAP my TAP Card again?? Makes NO sense at all its Free to make a transfer everywhere else around the world, for Example on the London Underground from the Picadilly Line to the Circle Line transfers are free they just charge you the 2 pound 10 pence fare if you travel within the same zone. Transfers should be FREE within the same zone in order to complete your journey!! The freeways are always jammed so, LA MUST IMPROVE ITS PUBLIC TRANSPORT SYSTEM by having more trains, Faster, more frequent RAPID service, Friendly, knowledgable bus and train drivers, Clean and comfortable buses and trains and ON-TIME service!!! The answer is because the Metro Board of Directors approved getting rid of the free transfer several years ago in favor of a day pass. As you say, many other agencies around the world have free transfers — although it’s also worth noting that the fares are higher than $1.50 in those places. Since Metro now uses TAP exclusively, I think it’s time to replace the day pass with a daily cap on cash fares. I often don’t know at the start of the day whether I’ll be making 3 or 4 trips, or whether I’ll use DASH or Metro for one of the trips, but right now I’m forced to decide at the beginning of the day whether to use a day pass. A daily cap will solve the problem, and should be easy to implement – London did it many years ago with its much more complicated zone-based fare structure. Replacing the pass with a cap would also spare me the need to carry separate TAP cards for cash and passes, since TAP always uses a pass if one is loaded on the card. This is stupid. Who the hell thought it was brilliant idea to do this? Nowhere in the world do I know of places that makes you pay for a transfer. They need to make transfers free like New York or move to a distance plan like Japan. The latter makes perfect sense because you only pay what you need and nothing more. Passes has to go. It makes things more complicated than it needs to be. One has to pre-plan if you need a day pass or not and no one has the time to do that. Just charge me as I ride through the system. If I go one stop, I pay for one stop. If go ten stops, I pay for ten stops. Simple as that. Why is Metro so SLOW to make common sense changes? Stop wasting our tax dollars and start doing your job!!! BTW if everyone is supposed to pay for each transfer, how is the transfer between the Blue/Expo transfer at Pico going to be handled? Passengers who come from the northbound Blue Line from the south make transfers there to the Expo Line heading towards Culver City. How is the transfer going to be done here? The Blue and Expo Line share the same platform. I don’t see people going to the TAP validator when they get off at Pico. They just wait at the same platform and wait for the Expo Line when it comes. See, this is why the entire “pay for transfers” is a stupid idea. It costs more money to re-arrange the TAP machines and causes tremendous confusion for everybody. Jake brings up a good question. Not only the Expo/Blue Line transfer at Pico, how about transfers between the Purple/Red Lines at any number of stations between Wilshire/Vermont to Union Station? The Blue/Green Line transfer at Willowbrook? It’s completely plausible that a person can come from the north using the Red Line and switch to the Purple Line at Wilshire/Vermont. Or, a person on the Red line can get on and realize they are on the wrong train and get off at any of the stations to take the Purple Line. Do people have to TAP twice in these cases too and charges twice? I agree with others that the whole thing is a mess than it needs to be. Metro has two options: get rid of transfers, or move to a pay-as-you-go system based on how many stations one goes through regardless of transfers. So it’s inconvenient to have to plan ahead regarding a day pass? So what else is new? If one buys season tickets to a symphony, or a museum membership, or a combine at a race track, one needs to plan ahead to determine if is worth it to fork over more money up front. I do think that the procedure could be explained much better to tourists and new MTA riders. What I would like to know is why there is not some sort of comprehensive day pass which would include all public transportation in LA County. Why not offer a day pass that would include municaipal buses (e.g. Big Blue, Culver City, Long Beach, etc.). Of cours, one could charge more for such a day pass. While we are on the subject of the TAP machines.. can someone please have the TAP Machines work properly at Willowbrook!! The tap machines that you see when you come downstairs from the Greenline only work in 1 direction. Right now, say you rode the Greenline and need to go downstairs to transfer to the Blueline, you have to TAP the opposite far side of the machine to officially TAP. However,this interferes with the people going upstairs to the Greenline. Everyone has to use the same side of the machine and that creates a bottleneck that just slows everyone down. Everyday, I see people TAPping on the side that should be working, but they don’t realize that they didn’t officially TAP. Now those people are vulnerable to get a citation from the Sheriff’s because the machine didn’t read their card. You can’t blame them because common sense says that side of the machine should work. I transfer at Willowbrook everyday and it really is way past time to fix this. Who thought up of this ridiculous idea? Has anyone working for Metro even traveled to other cities? Once you’re in the system, you get to make as many transfers as you want! That’s how everybody else works and it keeps things simple! Metro needs to stop playing with our taxes in trying to get the system to work with bizarre ideas. You know what’s a cheaper way? Just copy what other cities are doing! Stop wasting precious tax dollars like moving TAP machines to make it fit to your bizarre fare system that no other city runs on. No one in the world does this! The construction money used to move these TAP machines would be better spent on other things! If you want a simple system, why don’t people working for Metro just visit Taiwan try out riding the Taipei Metro? It’s so simple there. You fill up your Easy Card with money (you can also get a contactless token good for a single trip), you tap in, you make as many transfers you want to get to your destination (no additional fee for switching trains!!) and you tap-out at the destination. The card deducts the fare based on distance. Why can’t Metro do something simple like this? Keep it simple! I don’t understand why Metro wants to waste tax money to make things more complicated! Just visit Taiwan and you’ll see the practicality of everything. It shouldn’t be hard for someone to Facetime while in Taiwan and have everyone in Metro do a real time video conference and be amazed at how smooth everything runs, ashamed how so far behind Metro is, and how wacky and dumb their ideas were. TAP card is not a bad invention, but the turnstiles and TAP-per-rail line policy are. It is very difficult, if not impossible, to convert an honor system to a fully gated system, because it must be constructed with that in mind to begin with. That said, I really think a “window of riding” method would work well for Metro. Once you validate your TAP card, you have (for example) 2 hours to complete your trip no matter which line and which station your destination is. A fare inspector would just need to check that your tapping time is within the past 2 hours; otherwise you are cited. This would completely eliminate the confusion in transferring between lines and the hassle of re-tapping. I would also say that the Pico Station Blue-Expo transfer tapping is indeed the “mother of all confusions”. That’s the problem. Metro doesn’t have a budget for this. Humans cost a lot of money. And money is something Metro doesn’t have. That’s why it’s a far better idea to just have a “in the zone” system and have everyone do a TAP-out at the exit. That would be the fare inspector, only instead of a human, it will be done by a machine. I’d say TAP is a good idea, the turnstiles is so-so as it would be better with wider fare gates, but the entire structure on how Metro does them is totally whack. The entire problem lies on people working for Metro who, in their closested view of the world, has never stepped a foot outside of LA and have no idea how the rest of the world runs transit. If only people working for Metro could see the light on how other places run mass transit, they can see all the things they are doing wrong. And they should’ve done this from the beginning instead of waiting years until the problems started surfacing. THANK YOU! The current layout is super annoying but mostly dangerous for the elderly, handicapped, and anyone wrangling anything more complicated than a single bag. So happy about this change. Metro needs to realize that people hate the idea of being forced to “plan out ahead” to buy a Day Pass. People don’t travel that way. People go where they want to go. Look at it this way: people don’t buy a “Day Pass” worth of gas do they? No. They buy gas upfront. This is like charging up money into TAP. And they travel about freely wherever they want to go until it runs out of gas. This is like TAP deducting money based on distance. See, that’s the simplicity people expect Metro to replicate. And TAP is able to replicate this simplicity. Not this passes here, passes there, another fee for transfers, oh TAP is good here but not there, or transfer fee is different from muni-to-muni or Metro-to-Muni or Muni-to-Metro confusion. Keep things simple. Let us charge up our TAP with money like how we fill up our gas. Deduct it as we travel through the system based on travel distance. And we’ll refill it back up when it’s close to empty. Simple as that, just like filling up a tank of gas. Why make things complicated? For those who say that “why don’t you just buy a Day Pass” it’s because the Day Pass is a TOTAL RIP OFF for people who travel short distances. I live near Vermont/Beverly and my work is near Wilshire/Western. Metro wants me to pay SIX BUCKS for this because it involves a transfer? IT’S TWO MILES! YOU WANT PEOPLE TO PAY SIX BUCKS FOR TWO MILES!? I’m better off driving! And like hell am I going to pay $75 a month for two miles either! Metro, do you want to know why people aren’t giving up their cars? Because people are smart. Except, you think people are stupid that they will fall for your scam. People aren’t going to scammed into forking over whatever money Metro wants us to pay for day passes or monthly passes without factoring in distance. It’s just like a cell phone plan. If I know I’m going to be making less than 500 min of call time per month which is available for $30/month, you think I’m stupid to pay the more expensive unlimited call rate at $75/month? If I know I make very few calls because I can do everything with my data plan, I might as well just get the pay-as-you go prepaid top-up plan and charge up $100 and make it last me for the entire year! That’s how people make decisions. You think people don’t do that. And that’s why you FAIL. A day pass is currently $5. People are used to making all sorts of decisions regarding transportation. Do I take a freeway or a surface street? Do I try a shortcut? Should I use a parking meter or a garage? Do I take care of that warning light right away or can it wait until the next oil change? Do I go to specialty shop or a regular mechanic? Is it worth putting off my trip by a few hours to avod rush hour? We’re willing to go to great lengths to be virtual slaves to our automobiles, but we’re not savy enough to deal with MetroRail? Yes, LAMTA has a lot of room for improvement — and these forums have had some good examples — but the implication that the only thing keeping tens of thousands of more commuters from getting out of their cars is a confusing transfer policy is a bit much. BTW, I have seen LA Co. deputies let lots of riders off with warnings regarding TAP. Try getting a traffic cop to be as understanding next time you don’t come to a full enough stop at a stop sign. Transportation is a need. Unless you’re a total hermit, everyone has to go somewhere whether it be by car or by public transit. It just like other needs like food, water, electricity, and natural gas. And how are these things paid? Only by what people need. If you need less food, water, electricity and natural gas, you pay less. If you need more you pay more. If all you a laptop, you pay less in electricity over some another guy who runs a home server that’s on 24/7. It’s simple and straight-forward. So I agree with others that Metro should look into changing the fare system to only what people need. Since everyone’s travel needs differ from person to person, the fare system should reflect that. And the bare-bones factor of how a person’s travel needs differ is travel distance. It’s the most basic form of measurement that can be applied. If you travel shorter, you pay less. If you travel longer, you pay more. It’s simple and straight-forward, just like electricity. That would be the fairest way for everybody instead of coming up with awkward solutions like making riders to pay more because it involves a transfer regardless of travel distance and making things much more costly, complicated, and confusing for everybody than it needs to be by having people TAP when every time they switch lines. Less complications means less confusions. Pay only what you need. Nothing more, nothing less. Simple and straight-forward. If TAP has the ability to do this, and by reports from others, it can, then that’s the way we should be heading.